Naji Hakim was born in 1955 to Lebanese business parents. His family were well-travelled, and before the 1975 war, the family emigrated to France. Naj took piano lessons and practised on the school organ; his idols were Ravel, Debussy and Poulenc. In Paris he trained as an engineer in order to have a backup should his projected musical career fail (his father’s insistence). At the Paris Conservertoire he took many courses, widening his knowledge in general, gaining many diplomas. He studied organ with no less a teacher than Jean Langlais for ten years, and declared himself an organist able to adapt to any technical problems as a result. From 1993 to 2008 Hakim was a successor to Messiaen as organist at L’Eglise de la Trinité, and his composing style was influenced by the uniqueness of its light and elegant decoration, contrary to the gloom of many other large Parisian churches. He continues the great French Romantic style of organ playing and is particularly interested in the orchestral abilities of organs. Other major influences in his music come from his embedded love of Catholic ritual and mysticism (he was decorated by Pope Benedict XVI for contributions to Catholic sacred music). As well as thirty organ solos, he has written a symphony for orchestra, five concertos, chamber music for organ and brass, works for piano, harpsichord and harp, two violin sonatas, an oratorio for orchestra, choir and soloists, Masses and other vocal music. Alba has produced an interesting and unusual selection of Hakim’s work on this album, featuring the organ in solo and in concerto with a string orchestra, which itself is given a fine and testing piece for strings. The album was recorded in Juva Church in the lakelands of eastern Finland. Its parish goes back to 1422 but the current church was built of granite in the mid nineteenth century. The present gallery organ was installed in 2002 by the German Paschen Kiel Organ Builders, suppliers of many modern Finnish organs. The Juva organ has two manuals and full pedal board, with some15 registers in the Grande Orgue, 17 in the Recit expressif and ten pedal registers (including a 32′ Soubasse). Its character is that of late French Romanticism, and it is ideal for Hakim’s French organ style. Rather than setting his No.1 and No.3 Organ Concertos with full orchestra, Hakim sets them with a string orchestra, which is more likely to encourage performances, as marrying a large organ and large orchestra is an extremely expensive affair. Here the string chamber orchestra is St. Michel’s Strings, a 12-member group who form the third oldest orchestra in Finland. They started as an amateur musical society gathering in a small rural town and are now a high profile professional ensemble with a growing heap of recordings, rivalling the Ostrobothnian Chamber Orchestra, which is better known in the West. The St. Michel Strings begin this album with Hakim’s Påskeblomst for Strings, a homage to Carl Neilson’s lovely chorale for Easter morning, which appears in the first movement, followed by nine further short movements, highly inventive variations on the theme. For clues about the movements, the chorale text is printed on the back inlay in English and Finnish. This is essentially a fully Romantic piece, albeit somewhat modernised in the Britten manner. 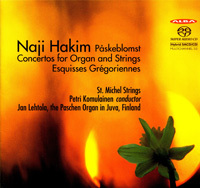 Each variation introduces Hakim’s expertly imaginative string writing, exploring many techniques, including pizzicato and solo playing. There is even a movement ghosted by Gershwin. St Michel’s Strings and their conductor, Petri Komulainen, meet every challenge and are deeply involved in this unusual but captivating piece, . Hakim’s First and Third Organ Concertos follow different paths in Hakim’s rich palette of musical moods. No. 1 was commissioned in 1988 by a Dutch Organ Festival. It is for organ manuals only, and moves in the direction of Poulenc. The first movement has boundless energy, with organ and strings tossing boisterous statements between them, while the second movement relaxes with a gentle swing, based impressionistically on fragments of Gregorian chant, which Catholics might recognise. The concerto’s third movement is a motoric toccata swapped between strings and organ, culminating with the organ’s brilliant triumph. Jan Lehtola is one of Finland’s most revered organists. He specialises in giving premières of new works and he certainly has the measure of this concerto. In contrast, the Third Organ Concerto (commissioned by the Royal College of Canadian Organists) Hakem returns to the improvisatory French Symphonic Organ style in which he excels. The organ (with pedals) and strings play in opulent harmonies, especially triadic ones. There are even jazz-inflected passages and gypsy strains from the Near East. Its first movement rhythms are full of breezy, nervous energy and humorous thematic material. Lehtola is kept busy altering registrations and executing flashes of glissando. The second movement is marked by a lovely broad singing tune, passed to the organ where it is glowingly orchestrated with changing register combinations. The String’s restatements are sometimes punctuated rudely by violent eruptions from the full organ. Pushing forward with more out-going tunes, the third movement demands sheer physicality from the organist, with rapid passage work, fast scales and more spectacular glissandi, with the organ fully tested at the same time by using many of its solo and combination stops. The final bars are thrilling, and the organist in particular deserves a standing ovation! Between the two organ concertos, Lehtola demonstrates some of Hakim’s writing for solo organ. Once again the seed material of Gregorian chant is used for a suite which also forms an organ mass. ‘Esquisses Grégoriennes’ refers to a technique developed by Tournemire and Langlais which paraphrases i.e. arranges a melody, this time not for voice but for organ. Each movement focusses on one or more registers, almost a study of the organ’s capabilities. Lehtola extracts every nuance from these atmospheric, impressionistic movements and renders them with poise and great beauty. The final movement, ‘O filii et filiae’, startles the listener with a sudden turn from mostly quiet, contemplative music to the full organ’s joyful rhythmic and dazzling finale. For those listeners familiar with Alba’s organ discs, it only takes a minute or two to recognise the characteristics of a recording by engineer Mikka Koivusalo. Challenged by the huge acoustic of the Juva Church to balance a large gallery organ and an ensemble of 12 strings with minimal loss of detail, he produces an entirely natural and convincing sound which is a joy to hear. Using simple arrays, separate ones for stereo and 5.0 multichannel, the listener is brought into the church and its space. An organist himself, he seems to have “magic ears” which find the sweet points for his microphones and gets the best sound that an organ can make. In this case, St. Michel’s Strings are also captured with the same warmth and detail as the organ. Each string group of is clearly located, and presents without any trace of being overcome by the organ even going at full tilt. Exploiting the deep resonance of the building, deep organ pedal registers and string double-bass contributions give the music a splendid foundation, and the Juva Church reverberant acoustic amplifies the strings so that they sound as if a symphony orchestra’s full string section might be present. Alba’s presentation gives plenty of information about the music and performers, although apart from a dark photo and registration list, there isn’t much information about the organ, and ideally there should be a photograph which shows the organ’s relationship with the overall church space. Texts are in English and Finnish. If you have not yet encountered Naji Hakim’s music, this is a fine starter. Given his fascinating absorption of styles from the Near East, French late Romanticism, mastery of the French Symphonic Organ School and a deep Catholic belief, I commend this disc to any listener wishing to explore further in modern music. The performances are exemplary, and sonic presentation is breathtaking.